When the son of Chicovaneg grew up, the men of his tribe called him Huachinog-vaneg because he dreamed so much, and because his thoughts were more often in the sky with his father than on earth with his people. Often for long hours he sat in the shade of a tree, sad-faced and lost in meditation. The son saw his mother to the house. She put out the light of the pine-wood torch and covered the embers on the hearth with ashes. But Huachinog-vaneg left the door open so that he might see the stars. ’Yes, my son, and I am glad. But there are mothers who have lost their sons, and mothers who are alone because their sons are far away, and there are those who never had a son. All are afraid of the dark night - as I am afraid when you are not here. Time passed. One day Lequilants found her son sitting on the ground, sketching many rings in the soil. ’Your father is not only brave but also cunning. He knows that the Serpent likes to drink deeply of the sweet dreams that flow along the horizon’s edge, streams of morning dew from flowers that grow, some at sunrise, some at sunset, streams that mix with star dust to make a sweet and heavy wine of strange power. How the star dust sparkles in this rare wine! And how the Serpent loves it! This wine at the world’s edge is the drink that alone can quench the Serpent’s thirst. So Chicovaneg descends at the end of each day to see that the Feathered Serpent has not taken too much of this ethereal wine. As the sage was speaking, a rabbit came jumping along, nibbling eagerly at the lush cool grass growing near their feet. Huachinog-vaneg accepted the sage’s counsel. He lifted the rabbit up by its ears and held it softly in his arms. Then he thanked Nahevaneg and bade him farewell. 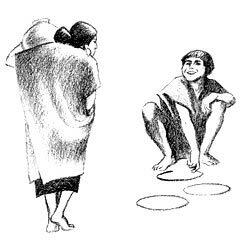 Now Huachinog-vaneg set himself to the task of making two shields. As soon as he had found a convenient place to work he made a heavy shield to carry on his right arm. Then he made another of the fine silky fibres of the maguey plant. It was so light and wondrously woven that when he held it against the Sun, he could see the Sun like a dark disk behind it. This shield he did not fasten to either arm, but carried it first in one hand, then in the other. He had no need of a spear, for he meant to follow the golden road his father had built from which all evil spirits had been driven back into darkness. In that bright light and always in full view of his father, he need fear no enemies. He provided himself also with a strong and long lasso, and when finally he was ready, he took his rabbit - Tul by name - and travelled to the end of the world. At the world’s end there was a deep cavern in which lived the great tiger Cananpale-hetic. 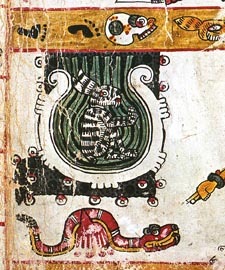 This tiger came out of his cavern and said to Huachinog-vaneg: ‘Do not fear me, for understand, I am the world tiger. Here is the very spot from which your father started on his journey. It was here he hesitated, because he feared to jump to the lowest star. Here in his hesitation he stamped one foot, and then the other, treading so hard that this cavern was formed. I fled here, pursued by savage coyotes which the evil gods sent to destroy me. It was then Chicovaneg saved me from the coyotes, and offered me this cavern as a home. And he sent the Feathered Serpent to kill the coyotes, so I was left in peace to heal my wounds. Now I remain here for eternity, to protect the road from the earth up to the lowest star. Huachinog-vaneg rested, and Tul ate well. Then together they climbed the rock Chabuquel. And before Huachinog-vaneg could reply, the rabbit Tul had jumped. He fell back at first without touching the lowest star. But he tried again and again, and at last the tip of one of his long ears touched the star, and he struggled with his legs to get a foothold. A branch of a thornbush helped Tul to scramble onto the star. Then free of the thorns, he leaped up onto a high rock, jumping up and down until Huachinog-vaneg could see him. 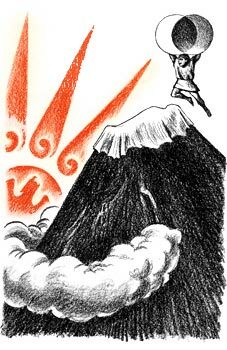 Huachinog-vaneg threw his lasso to the star; Tul caught it and fastened it onto the peak of a rock, and Huachinog-vaneg swung through space on the lasso and landed on the star. Together in triumph they went to greet the inhabitants of this first star. And thus did they wander from star to star, taking only tiny fragments from each one; for the Sun of the Night did not need to be as large or as bright as the Sun of the Day. To make a lesser and cooler light than that of the great Sun, Huachinog-vaneg tied each bit of star as it was given him to the lasso and let it down into the black void to cool off. ‘How clever you are!’ said Tul. ‘How did you manage to do that?’ And Huachinog-vaneg showed him. He took the shield in his left hand and moved it slowly in front of the shield of the Night Sun which was fastened on his right arm. As the shade of the lighter shield moved across the heavier shield, the Night Sun became smaller and smaller until it was completely shadowed and only its darkened outline was visible. And slowly, slowly, Huachinog-vaneg moved the lighter shield along, letting the Sun-of-the-Night shield become larger and larger until it regained its full size. When his mother looked up at the sky and saw this, she called her neighbours together, and said: ‘Now I can lie down and die in peace, for I have done my duty on earth. I have repaid the good earth for the life it granted me. I had a brave husband, and I bore him a son who was wiser and cleverer than he.’ Saying this, she bent down to earth, and died on her knees. 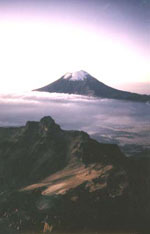 The men of her tribe took her up to the highest mountain peak in the centre of the land, where she would be closest to her husband and her son. And the sky covered her body with a white mantle of eternal snow. The first ray that Chicovaneg sends to the earth each morning kisses her forehead before it reaches other people, and the last ray in the evening envelops her body in a red-gold glory. Huachinog-vaneg journeyed steadily across the firmament bringing the light of the Night Sun to mankind. And so faithfully did the Night Sun make its changes that people on earth came to look to it for the order of the days and the hours and the months and the tides. Once Huachinog-vaneg stumbled on his way and was late in his journey, and the people became confused in their accounting of the time. And so it is to this day. Angered by these words, Huachinog-vaneg grabbed Tul by his long ears and lifted him to hurl him forevermore into the black void of Balamilal. But Tul turned his face to Huachinog-vaneg, grinned and blinked, and cheerfully kicked his legs above the black void to show he was not afraid. 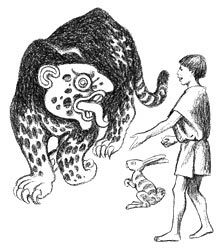 And seeing those great kicking legs Huachinog-vaneg suddenly remembered how this rabbit had leaped out into space for him, risking his life every time, over and over, so that he, Huachinog-vaneg, could beome a god. And gratefulness rose up at last in his heart. 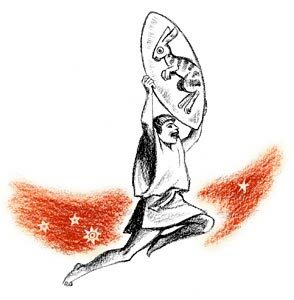 Then Huachinog-vaneg removed some of the little star-fragments from the middle of his big shield and set the rabbit Tul there, where he can be seen to this day. 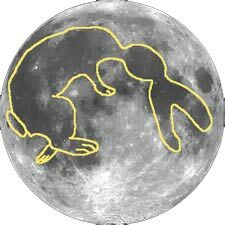 And this is how the rabbit Tul became part of the Mexican people’s calendar, as a grateful reminder of his help in kindling for them the glorious Sun of the Night. Note! Some have suggested - as reflected in some of the images - that the hero of this story is a hare rather than a rabbit; we’ve decided to leave it as rabbit, and so remain faithful to Ben Traven’s original. Can I get this story in Spanish? 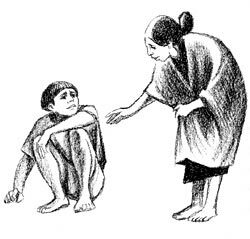 Mi origen es nahuatl y zapoteca y esta historia me fue contado por mi bisabuelo donde quetzatcoaltl tenia hambre y el conejo era su unico alimento. Mexicolore replies: Gracias por compartir tus recuerdos con nosotors, José. I LOVE THIS ARTICLE ITS SO INTERISTING!! !